Neal Bascomb writes in a pulse pounding way that brings urgency to the topic at hand. When he opens this book on Garibaldi Street outside of Buenos Aires, we already know what is going to happen. But as you are waiting for the bus to arrive you find yourself worried when it is late, that something has gone wrong. This is writing at it's best. In recounting the tale of one of the largest manhunts in history Mr. Bascomb provides background on all of the lead characters. He also skillfully weaves in and out of the politics that wrought these events. I was 7 years old and living in Brooklyn, New York when Israels' Mossad kidnapped Eichmann from Argentina and tried him for murder. He was found guilty and hung. I had seen the documentaries about his capture and trial but never gave much thought as to exactly how he got to Argentina in the first place. I always assumed that Eichmann, along with thousands of other former Nazi's, went there immediatley after the war was over. This is not true. Eichmann wound his way through several American detention camps in Europe at the close of the war, escaping several times. He carefully kept his identity hidden through the use of false documents provided by an extensive network of former Nazi's. Mr. Bascomb takes us on a journey through the mountains of Germany and Austria showing us Eichmann on the run. He works as a lumberjack for 18 months before finally making his way to Genoa. From there he obtains the necessary Visa's and Passport to travel to Argentina. His new name is Ricardo Klement. Carefully woven into the story is the subplot of why Argentina became the haven for former Nazi's. This involved Juan Peron's government and their quest for industrial leaders to become a major power in South America. Ironically, the Argentine government declared war on Germany a few weeks before the war ended. In this way they would remain unlinked to the war crimes trials that were going to take place. Argentina had been the main intelligence gathering point for the Germans during the war, while carefully retaining "neutrality." This book reads like a master spy thriller. With the Haganah team tracking every possible lead Eichmann still manages to board the Giovanna C in Genoa and actually makes it to Argentina. There he uses his experience as an Architect to gain some employment with the government. Simon Weisenthal plays a large role in keeping the fires lit so that the search will not die. His efforts are instrumental in bringing Eichmann to justice. A group of Israeli operatives, who have a very personal stake in this chase, are relentless in their pursuit and capture of Eichmann in Argentina. This book covers the years 1945 through the trial and verdict in 1961. During those 16 years there was always someone looking for Eichmann. With every false report of his death Eichmann hopes that he has eluded his past. He rationalizes his role in the Final Solution as having only obeyed orders. His wife and children eventually arrive in Argentina. Mr. Bascomb gives us an up close look at the family and how they coped with living this secret life. 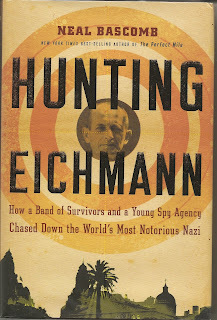 This book is the result of painstaking research - even utilizing some of Eichmanns' own account of his time on the run. Eichmann was transported out of Argentina in a steamer trunk aboard an El Al flight to Israel. There he was tried, convicted and hung for his role in the murder of 6 million Jews. This book lives up to everything I have come to expect from this author. He lures you in, keeps you interested and then delivers the goods. Two Great Movies- "Flawless" and "Holiday Heart"